Shrink rays may exist only in science fiction, but similar effects are at work in the real world at the National Institute of Standards and Technology (NIST). After successfully miniaturizing both clocks and magnetometers based on the properties of individual atoms, NIST physicists have now turned to precision gyroscopes, which measure rotation. The NIST team has demonstrated a compact atomic gyroscope design that could, with further development, be portable, low power, and accurate enough to be used for navigation. Gyroscopes, traditionally based on mechanical components that spin or vibrate, are common in navigation applications and are increasingly used in consumer electronics such as smartphones. The new NIST device might find uses in applications requiring ultra-precise navigation with extreme size, weight and power limits, such as on spacecraft or submarines. As a bonus, the NIST gyroscope can also simultaneously measure acceleration. A combination gyro/accelerometer enables navigation by “dead reckoning,” without reference to external landmarks or stars. The NIST gyro’s glass atom chamber is just 3.5 cubic centimeters in size. The entire experimental setup, including low-power lasers and optics, is currently tabletop sized, but NIST researchers aim to shrink the whole apparatus down to a portable cube about the size of a mini refrigerator. Described in Applied Physics Letters, the NIST gyro is an atom interferometer. It is based on an expanding cloud of laser-cooled atoms, a technique originally demonstrated at Stanford University in a 10-meter-high “fountain” of atoms. Traditional optical interferometry involves combining or “interfering” the electromagnetic waves in light and then extracting information about the original light paths from the resulting wave patterns. Similarly, atom interferometers—taking advantage of the fact atoms act as both particles and waves—interfere these waves to measure the forces on atoms. When atoms speed up or rotate, their matter waves shift and interfere in predictable ways, visible in interference patterns. The heart of the NIST gyroscope is a small glass chamber containing a sample of about 8 million cold rubidium atoms that are trapped and released. While the atoms fall under gravity, a laser beam causes them to transition between two energy states. This process involves absorption and emission of light particles, which gives the atoms momentum and causes their matter waves to separate and later recombine to interfere. The cold atom cloud expands to as much as 5 times its initial size during the 50 millisecond (thousandths of a second) measurement sequence, which creates a correlation between each atom's speed and its final position. Rotations are simulated by tilting a mirror below the chamber. The interference effect on an atom depends on its speed, so rotations generate interfering bands of atoms across images of the final cloud. The atoms are imaged by shining a second, weak laser beam through the cloud. Because atoms in different energy states absorb light of different frequencies, the final energy state of the atoms can be detected. 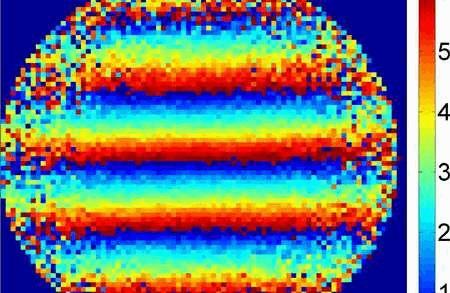 The resulting images show interference bands of atom populations in the two different energy states. The rotation rate and rotation axis are measured by analyzing the spacing and direction of the interference bands across the atom cloud. Acceleration is deduced from changes in the central band. The interferometer is sensitive to acceleration along the direction of the light and sensitive to rotations perpendicular to the light. Atomic gyroscopes generate less bias (or signal when not rotating, a type of error) than conventional precision gyroscopes, which use ring lasers. The NIST system is not only smaller but also simpler than other similar atom interferometers. The NIST research group has been working on various mini-gyroscope designs for a decade. In years past, they have fielded interest in mini-gyroscopes for use in locations where satellite navigation is compromised due to unintentional interference or intentional jamming.